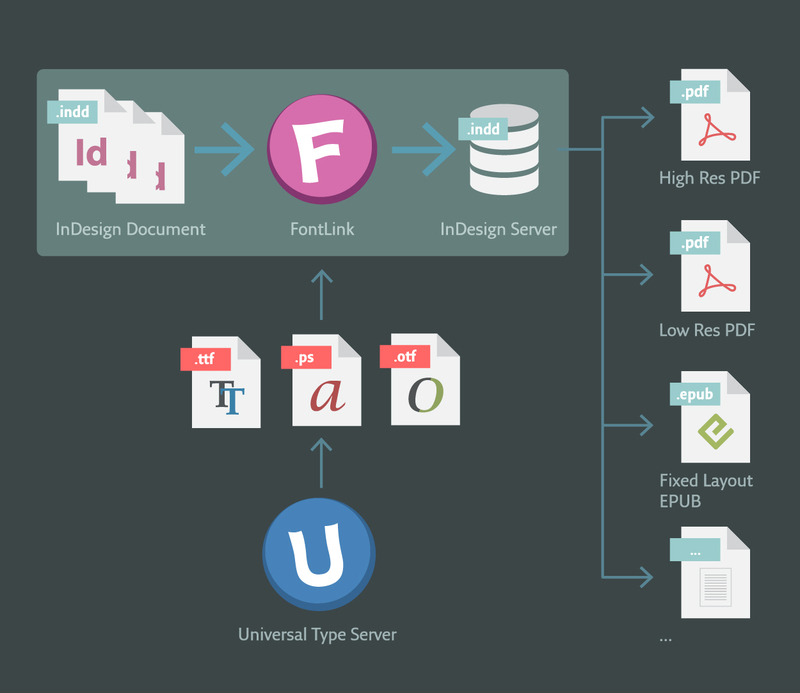 Extensis® today launched FontLink™, a new module for the professional font management system Universal Type Server®, which delivers fonts for documents in automated publishing workflows that use Adobe® InDesign® Server. Speeds up Document Processing: FontLink examines and gathers fonts for InDesign documents at any point before they are handed off to InDesign Server, removing manual document processing tasks for output. Ensures the Correct Fonts with Font Sense: FontLink leverages Extensis’ patented Font Sense™ technology, an innovative font identification technology that ensures a smooth workflow by identifying, locating, and activating the exact fonts used in documents. During the creative process, Universal Type Server’s font auto-activation plug-ins automatically embed Font Sense metadata to identify fonts in use in InDesign documents. FontLink then collects the required fonts from Universal Type Server for output. Easy Content Management System Integration: FontLink is easily integrated with most popular professional content management software solutions and fits any point prior to InDesign Server processing. Jobs are processed using straightforward input, output and error folders, ensuring the most straightforward integration. Delivers Real-Time Alerts: FontLink actively monitors documents for font-related errors, relieving publishing administrators of what is currently a manual, time consuming process that can have costly implications if errors inadvertently make their way through. Administrators receive real-time alerts of any errors so the workflow can keep progressing, saving both time and money. Extensis is also partnering industry leaders in the publishing industry, including vjoon, to integrate FontLink into its world-renowned publishing platform vjoon K4. Together, Extensis and vjoon will streamline font delivery in automated publishing. Andreas Schrader, CEO of vjoon, noted, “Automation and agile production processes are essential for today’s media publishing and content marketing businesses. Creative designs often use lots of fonts, and when utilizing automation that calls for a flexible font management. FontLink now offers an adequate solution for our automated workflows in vjoon K4. This way vjoon K4 helps to create content in a lean and highly efficient way." More information on FontLink can be found here. The module is available in English, French, German. Adobe and InDesign are either registered trademarks or trademarks of Adobe Systems Incorporated in the United States and/or other countries. vjoon, vjoon K4 and vjoon Unified Publishing Process are registered trademarks of vjoon GmbH in Germany and/or other countries.